As I sit here and rethink my entire experience, I can’t believe it’s a little over a week since the race. I remember wishing this day to end, and now it is over. 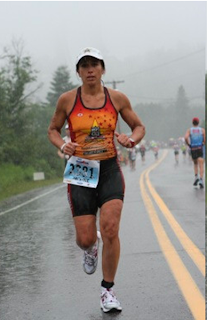 I allowed the intimidation of the race called the IRONMAN take control of all my feelings. I trained with determination and wanted to be prepared to conquer. My vision of the day was LONG but it didn’t feel that way at all. I remember asking someone on the sideline, what time is it? It’s 6pm. I was shocked that I was doing this since 7am and it’s now 6pm. WOW!!! So take a moment to relax and/or drink a nice cold beer as I try to keep my story entertaining for you. At 3am, I arose from the bed. It was so easy to do because I didn’t sleep a wink that night. I ate my oatmeal and half a peanut butter sandwich. I tried to be extra quiet so I wouldn’t wake Joel but needless to say he too was up all night. After I ate, I went back to bed for another hour. The thoughts that were going through my mind were intense. My main concerns were to get through the swim in one piece, no flats on the bike, and be able to run not walk the marathon. After my preparation, I found Alan waiting in his car outside my room at 5am. I was happy to see him and my attitude was calm and cool. He drove me to the start and I was ready to conquer the longest day of my life. I got body marked and the morning felt still and quiet. It was so surreal. I went to my bike and stood around just looking at everyone. 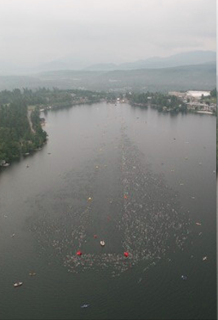 It didn’t sink in yet that this was the day – The IRONMAN. I went to get my tires pumped and got myself ready for the swim start. Alan shouted my name as I was making my way down the swim chute. I was so happy to see him, and I felt GREAT!! Of course I didn’t like the down pour of rain which made me visualize the bike segment. It’s not going to be fun in the rain!! Well, as my friend Suzy says, at the end of the day my health and well-being are more important than a race. I finally make my way to claim my bike bag and headed to the women’s changing tent. It was dark and muddy. I finally finished getting dressed and the volunteer took my bag to put back on the hook for me. (I liked that option too.) As I exited the tent and ran to my bike, a volunteer shouted # 2381. The next thing my bike was handed to me. It can’t get any better than this! I exited the transition area; I hopped on my bike and start pedaling on this steep downhill. It was very scary. I decided to get off my bike to pass this steep hill because there was a sharp turn ahead. It was not fun and everyone around me felt the same way. One person shouted it’s a day of survival. I finally get myself back on the bike and prayed that I would survive. I started getting into a groove and said to myself “just take it easy and be conservative.” The hills were massive and long, and the downs were very SCARY!!! I would hit my breaks and literally hear my tires screech. OH MY GOD!! What am I doing?!?!?! I was getting a chill and my teeth were chattering. This is great. I’m freaking cold and wet, and now I have to pee. I remember a friend’s advice: he told us the night before, if you have to pee, do it on the bike. To me this was not an option that I was considering. Well, my bladder was ready to explode. The next thing I knew I was peeing. I can’t believe I am peeing on my bike, but you know at that time it was such a relief it didn’t really matter. The funny thing was it became a habit, and it was a newfound talent I manage to adapt to for the entire bike segment. As I made my way back to town and completed loop 1, I saw Alan shouting on the sideline. It was great seeing him and I was off for loop 2. My 2nd loop felt a lot tougher. I said to someone “I don’t remember this massive hill.” She agreed. The final 12 miles were the longest. When I finally finished my 2nd loop and conquered the last massive hill in town, the crowd was cheering and saying you got this. I felt very emotional, and I was also relieved that I was completing my weakest segment. I finished and felt good other than my quads were shouting out at me in pain. I entered the transition area and a volunteer took my bike. (These volunteers are so AWESOME!!) I was off to get my run bag and then to the dark women’s changing tent. I happened to find a seat right by the entrance, which helped on the visibility. A volunteer approached me and said, “If you going to remove any clothes please do sit farther from the entrance.” I said, “Sure I understand.” In all honesty, I could give a hoot if someone saw me bare. I think everyone is focused on the race rather than seeing my bare behind. Now, I love to run, but man! It’s a whole different concept when you have biked 112 miles. It finally stopped raining at some point. I was experiencing huge stomach pains, and it was such a relief to see a port-a-john up ahe ad. Let’s just say I made it in time. Another huge stomach pain came on 10 minutes later, and yet again, I made it to the port-a-john. I think throughout the entire run, I must have stopped 10 times, at each port-a-john! It was very annoying, and every time I stopped, my legs cramped. There were no thoughts of having a gel! So I survived with cola, one chocolate chip cookie, chicken broth, and Gatorade. If I didn’t have such horrible stomach problems, I probably could have shaved off 40 minutes from my run. On the 2nd loop, I also felt huge pain in my quads; so much that it penetrated all the way down my legs. Every step I took was agony. I saw someone I knew on the course. I can’t remember his exact words because I was just going through the motions. I think he said, “Is this supposed to be fun?” Well, I sure didn’t find it fun. The final loop of the run was all pure mental toughness. I remember someone saying to me “Enjoy your moment.” Well that was 10 miles away from the finish, but it got me all teary eyed. I couldn’t wait for that moment. 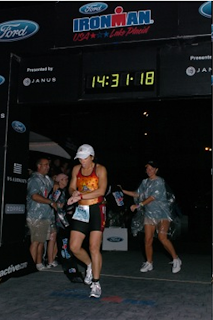 My vision was as I enter the oval, I will have chills from the crowd, a huge smile, and my hands up in the air as I hear those words from the announcer “Janine Leveque you are an Ironman!” This vision was embedded in my brain. I even told Joel a week before the race that I am going to enjoy that moment. I saw Alan 4 times, and I was looking forward to seeing him each time. It was my only way of surviving; knowing I get some reassurance from Alan. He saw I was experiencing a lot of pain and shouted, “If you have to; WALK.” I did take his advice, but at one point I said, “You have got to run the rest of the way.” I did, and it was extremely painful. I finally saw mile 20 and was so relieved. I had a 10K left before I would be known as an IRONMAN. I think my mental toughness kicked in again as my body became numb to the pain. As I approach the final 2 miles of the run and climbed up that final mountain, Alan said “Janine you got 3 more miles” and asked if I want him to run with me. Now I was in my own world, but I managed to know where I was. I corrected Alan and said “I have 2 miles, and sorry Alan, I don’t want you to run with me.” First, the last thing I needed was an extra mile, and second, I couldn’t torture anyone with what I was feeling. I managed to continue to hold on and saw a friend by the special needs bags. He was so excited to see me and started running alongside me. I begged “Please don’t run with me.” Whether he was going to or not, I needed to be alone. I needed to be focused, and I was in so much pain. I had one mile left. 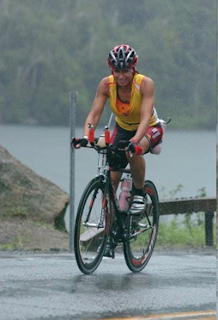 JANINE LEVEQUE YOU ARE AN IRONMAN! I crossed the finish line like a zombie. I was so delirious and wiped out with fatigue. I did manage to see the time on the clock and was so thrilled to see 14h:31m. The volunteer person came to me, and I almost fell to the floor. He walked me around. Joel and Syed found me. Joel smiled and said to me “You are an IRONMAN.” I smiled back, and I felt like I was drunk. I was taken to the medical tent with chills, fatigue, and exhaustion. Joel, Syed, Alan, and Harold were all with me in the medical tent as I was being nursed back to health. What a great staff of people in the medical tent! The final hours of my IRONMAN day were spent trying to feel better about missing out on not seeing the final finishers. I really wanted to see that, but I hope next year I will feel a whole lot better. It was the most amazing day even with all my pain and suffering. It’s an experience that I will remember for a lifetime. I want to thank all my friends for their support and for giving me all the strength I needed to tackle the most challenging day of my life. A special thank you goes out to Suzy for joining me on my long runs. She is such an amazing friend for tackling those miles with me. Another special thank you for my friend Alan who drove up to Lake Placid to cheer me on and to give me all the encouragement I needed. What a guy!! My friend, Matt W., thanks for pulling me through in the water, and telling me that I could do this. His words of wisdom gave me strength. Mi flaca, Olga, she made certain that I ate everyday, and I got my rest. She kept me in line; your caring heart and friendship mean so much to me. Lots of hugs to you guys!! Also, a HUGE thanks goes to my friend Lon. I thought of you a lot on that course. I think you were more excited than I was. I want to thank you for your support, and all your positive vibes that I could do this. It helped me tremendously. You are truly an amazing person and a great friend! To my beloved Joel, he is one amazing athlete. His time was 11h:10m. To be quite honest, without him, I would never have attempted triathlons, let alone the IRONMAN!!! I am so proud of him. He may be tough with me, but he is even tougher with himself. It all pays off with his determination. 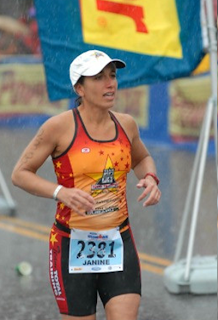 I am so proud of you Janine, love, love, love the race report. Pics are great, only you could look good on such a miserable day. Hey Janine - this is your old swimming buddy, Chip. I just wanted to offer my congratulations. An amazing achievement and I'm incredibly proud of you! Way to go, IRONMAN! Take care and good luck in your recovery and future racing! And a quick "hello" too to Suzanne and Jessica! You are truely amazing. I remember watching IRONMAN races on TV and now to know someone that has completed one is an honor. Congrats keep enjoying your moment !! Thank you for your congratulations. It was truly an amazing day. As they say pain is temporary but pride last forever!! Chip, nice to hear from you. I hope all is well with you. Keep me posted as to when you plan on doing an ironman. I'm glad you all enjoyed reading my experience. Wow...I feel lazy and tired all at once when reading that! But, most importantly I'm inspired! Congrats to you for a great IRONMAN!!! Hope to see you soon at a run with Hellgate!